Despite what once was a popular opinion, bacterial cells are not mere sacks of enzymes. Rather, we are discovering that they are highly structured. (Although, this probably should have been expected) Bacterial cells have to know where their poles are located in order to create such structures as E. coli’s chemotactic nose, Caulobacter’s stalk, and polar flagella. Cells must also be able to recognize where their midpoints are located in order to divide or differentiate properly. Furthermore, we are finding that the bacterial chromosome has a distinct physical arrangement, which can ultimately determine gene expression. In order to attain such organization, bacteria must have ways to pinpoint proteins to these specific locations. One way they may do this is through curvature sensing. As we can easily see, in rod-shaped cells, poles tend to have a larger curvature than the midsection. In some cases, curvature can differ via the direction, not just magnitude. In the case we will look at today, done by the Richard Losick lab, a protein recognizes the positive curvature of a forming forespore. SpoVM (“Spo-Five-Em”) is a Bacillus protein that localizes to the outer forespore membrane during the beautiful process of sporulation. Despite being a membrane protein produced in the mother cell, SpoVM is present only on the forespore and does not appear at all in the greater cell membrane. Therefore, this raises the obvious question of how such recognition occurs. 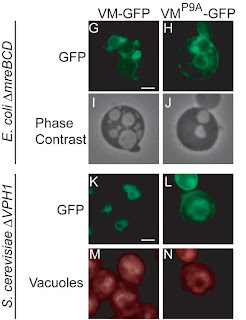 The first (and most probable) method is that known as “diffuse and capture.” The idea is that SpoVM localizes to the cell membrane and then diffuses through to the connected membrane of the developing forespore. Once here, a forespore-produced membrane protein captures the diffusing SpoVM. To test this, the Losick lab prevented SpoVM production until after the forespore engulfment. This way, there would be no contiguous membrane from the mother cell to forespore for SpoVM to diffuse through. The result was that SpoVM still localized only to the forespore, despite a lack of continuous membrane. Since this ruled out diffusion, SpoVM must have another method for such a specific localization. Rather than attempting to address whether a second protein attracts SpoVM (a question that would be slightly difficult to address) the researchers thought that localization might occur due to the specific curvature of the forespore. A logic al thought, since the forespore is the only positively curved membrane structure in the Bacillus cell. If true, then SpoVM should localize to any membrane with positive curvature without regard to the membrane’s original source, location, or other proteins present. In fact, this is what occurs. SpoVM localizes to any positively curved membrane surface. This was shown in vivo with mutant Bacillus that formed internal vesicles, along with mutants of E. coli and Saccharomyces cerevisae that have the same phenotype. Furthermore, in a completely cell free system, SpoVM shows the same localization to small membrane vesicles. Mutants of SpoVM can also be isolated that show a non-discriminatory phenotype and will localize to membranes without regards to their curvature. This shows that the ability to recognize positive membrane curvature is inherent in the protein itself. Adding to these data, SpoVM appears to have specificity not just for positive membrane curvature, but also for curves with a diameter of 1 micron or less. This is about the same as a Bacillus forespore. What is the lesson here? Bacteria have unique ways to examine their surroundings and their selves to allow for proper cellular organization. Although membranes with positive curvature within a bacterial cell are rare (photosynthetic vesicles and forespores), negative curvature is obviously not a rare phenomenon. Perhaps similar mechanisms maybe used to identify cellular poles based on degree of negative curvature. There is even a possibility that curvature-sensing molecules are used in eukaryotes to identify various organelles within the cell.